As the steel industry is so massive, so is the scarp industry. Most of scrap are recovered from old electric scrap, electronic equipment including computers, military equipment, jewelry etc. 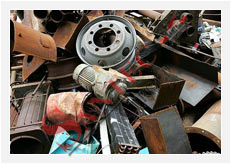 Scrap industry also covers the major recyclable materials, from metals to plastics, paper and pulp, rubber and glass. The use of scrap instead of virgin ore has several advantages, significantly in energy savings. If one of the attractions of ferrous and nonferrous scrap is in energy savings, the other being price levels that are particularly attractive. Not only the steel industry is large, but other base metals are also promising. In fact, around 40% of the world's need for copper is provided for by scrap. Using scrap not only reduces air pollution and water use, it also conserves natural resources. The greatest environmental benefit from using scrap, instead of virgin ore, is the reduction in greenhouse emissions. Recycling metals saves new energy use by the mining industry. Whether or not base metal, there will always be a need for scrap metal. With energy looking to remain costly and concern for our environment set only to increase, scrap industry continue to remain crucial for almost all industries.